Easy recipe for a tomato bruschetta that features mozzarella cheese cubes and fresh basil. Serve with toasted crostini for the perfect finger food. This simple tomato bruschetta with mozzarella is proof some of the best recipes have few ingredients and are easy to put together. 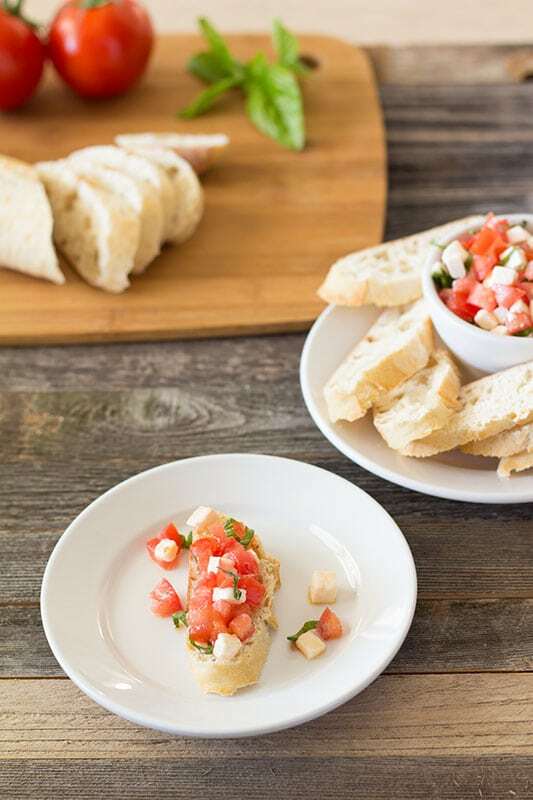 Served as an appetizer or light snack, this Tomato Bruschetta with mozzarella is a great way to use the bounty of ripe tomatoes available during the summer months. 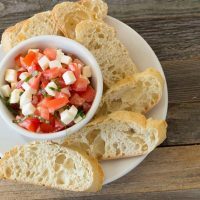 Tomatoes are one of the main ingredients in tomato bruschetta with mozzarella and they really need to be the best ones available. In my opinion, there is no winter tomato or canned tomato product that can beat the taste of tomatoes fresh from the garden or farmers’ markets. I eat fresh tomatoes in the winter, just not as often as I do in the summer. I find the ones available in the winter to be pink and kind of tasteless. However, if you are looking for something different to serve at gatherings, this will work with the “on the vine” tomatoes, Roma tomatoes, or even cherry tomatoes from the store, even through the winter. If there are any mealy parts to the tomatoes in the middle, cut those out and discard them when removing the seeds. It’s easy to seed tomatoes using a clean fingertip. Just reach in there between the walls of the tomato and gently scoop the seeds and the extra liquid. DO NOT squeeze the tomatoes to get the seeds out. While it is fine to do that with tomatoes going into a sauce or being baked, it will make the tomatoes seems mushy in the bruschetta. No matter which kind of tomatoes you choose to use, remove the seeds and the wet part from the middle of the tomato. 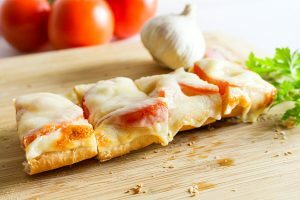 Put the diced tomatoes onto a paper towel to absorb a bit of the moisture before adding them to the diced mozzarella cheese. Don’t add the salt too soon before serving, the salt will pull the moisture out of the tomatoes and put it right into the bottom of your bowl. Alternatively, you can salt your tomatoes and allow the juice to run out before adding them to the bruschetta mixture. Some believe that salting tomatoes first gives them more flavor. Fresh mozzarella cheese tastes the best in this recipe. It is not as salty as the blocks of mozzarella available in most grocery stores. Fresh mozzarella has a softer texture that I find more appealing in this dish. Because it’s softer it will also absorb a bit of the tomato juice and will definitely hold on to more balsamic vinegar if you choose to add it at the end. I have used the blocks of cheese before and it still tastes amazing. So if that’s all you have, go ahead and use it. Our recipe uses granulated garlic, garlic powder. Some garlic seems to be potent than others. Biting into a hot piece of raw garlic can ruin the entire experience. I am not about to break out a pan to cook garlic either when it’s just as simple to add some granulated garlic. I always know what I am getting and I know exactly how much to add to my bruschetta. I feel the same way about winter basil as I do winter tomatoes, so I tend to use dried basil during winter because it seems to be more flavorful than the basil crammed into clear plastic shells from the store. I suppose I should try growing my basil indoors in the winter. Serve this with crostini, slices of Italian bread that have been lightly toasted. When I am not busy being lazy, I lightly brush my baguette pieces with olive oil or butter before toasting in a 400 Degree F oven. There are lots of ways to make crostini. 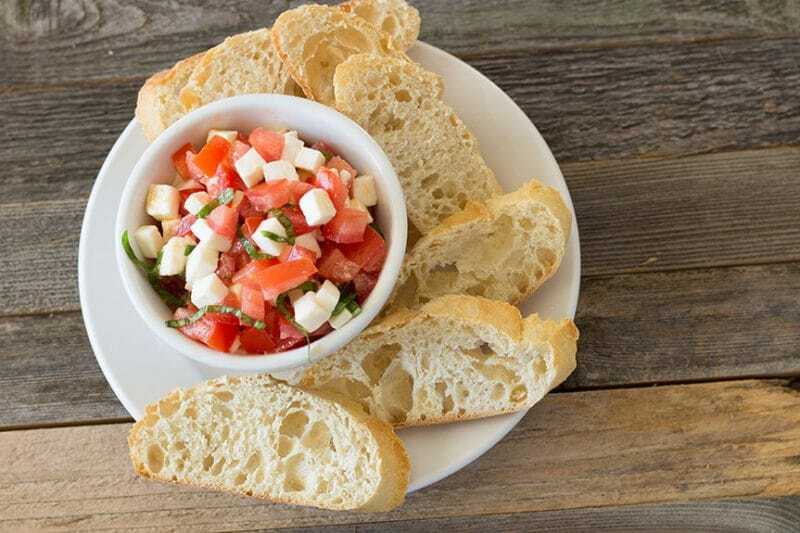 Any crostini will make a fine base for this tomato mozzarella bruschetta topping. Except now it might not be bruschetta, it might just be a crostini topped with tomato and mozzarella salad. I know, it’s confusing. Bagel chips also make a great base! Tomato Bruschetta with Mozzarella is pretty much ready to eat as soon as it has been mixed well. I prefer tomato bruschetta with mozzarella cheese room temperature or cold and served with toasted warm bread pieces. It can be heated up after it has been added to the bread. I have a few friends who eat it that way when they have taken leftovers home. Bake it in a 400 Degree F oven just until the cheese starts to melt. I prefer to just make cheesy tomato bread though if I am looking for a hot tomato and cheese appetizer. For a really special treat, try drizzling some balsamic vinegar over the tomato and mozzarella after putting it on your toasted bread pieces! Now you’ve got a Caprese Bruschetta!! 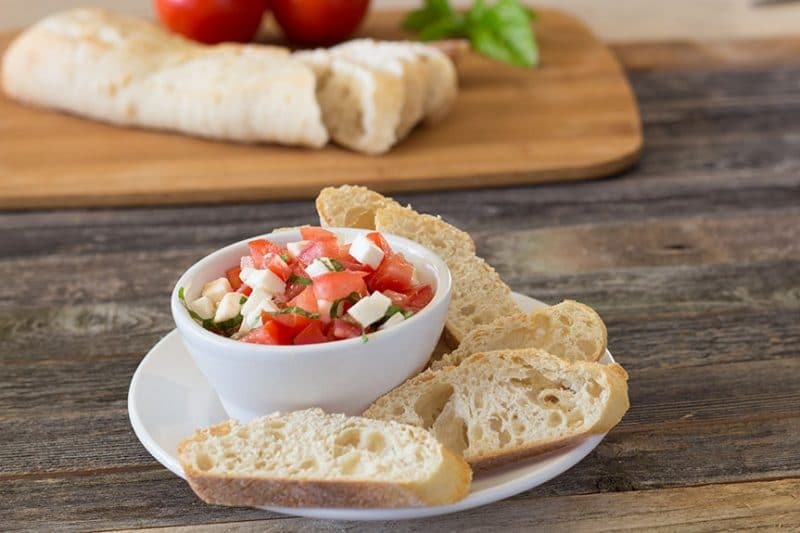 Leftover bruschetta should be placed into an airtight container and stored in the refrigerator for up to 4 days. It will be safer for longer than that, but the tomatoes and cheese will start to turn mushy. I don’t recommend freezing bruschetta. Both the tomatoes and the mozzarella will get weird after thawing. This dish comes together in under 10 minutes so it’s actually easier to make new than it is to thaw frozen anyway. A simple tomato, fresh mozzarella, and basil topping for toasted baguette bread slices. Cut mozzarella cheese into small cubes. Place in a bowl. Cut tomatoes in half and remove seeds. Turn over onto paper towels to drain some of the liquid. Cut tomatoes into cubes roughly the same size as the mozzarella cubes. Place in a bowl with tomatoes. Cover with garlic powder, basil, salt, and pepper. Drizzle olive oil over the top. Gently stir to mix. This can be eaten at room temperature or refrigerated. Preheat oven to 425degrees F.
Thinly slice the baguette on the bias and place on a baking sheet. Bake bread until it begins to lightly brown on the edges, 5 to 10 minutes. Can be plated separately or tomato mixture can be placed on top of bread for serving. Bread can be rubbed with cut garlic and drizzled with olive oil prior to baking.